Find us on Stand 113 at the European Neuro Convention (26-27 March) where we are representing Hocoma and Motek! 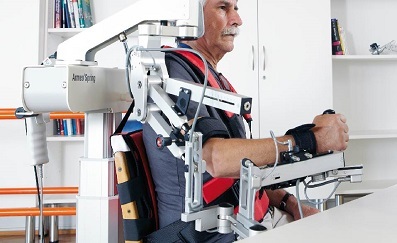 We’ll be demonstrating the C-Mill treadmill, the ArmeoSenso upper limb rehabilitation device, and the Andago body weight support system on the stand. We will also be demonstrating the Hocoma ArmeoSpring for the first time at #Neuro19! We’re demonstrating the Andago in the Live Demo Area – keep your eyes peeled for more details. We have been pleased to work with the C-Mill treadmill for a number of years with our partner Motek. Now distributed by Hocoma, the C-Mill is a force treadmill which provides assessment and training of gait and balance. It uses movement, virtual reality (VR) and augmented reality (AR) as part of the therapy process. The C-Mill allows for gait adaptability strategies through targeting and obstacle avoidance in a safe and controlled environment. You can read testimonials from the Portland Hospital for Women and Children who used the C-Mill for children with cerebral palsy, and The Brain and Spinal Injury Centre (BASIC) who use the device with stroke patients. We also have a case study written by Jakko Brouwers and Sarah Harling from the Morrello Clinic, analysing the recovery of stroke patients using the C-Mill. For all our testimonials, click here. The Andago is an innovative free-moving robotic body weight support system, which bridges the gap between treadmill-based gait training and free overground walking. The Andago actively follows the patient while they are supported in the self-directing robotic device. As the Andago is hands-free and is flexible to use from room to room, this means therapists aren’t exposed to physical strain and don’t have to focus on the security and stability of their patient. Instead, they can focus purely on delivery high-quality therapy for the patient. The ArmeoSenso, part of Hocoma’s Armeo range, is a new development in the field of upper limb rehabilitation. The ArmeoSenso consists of a set of movement sensors,which are attached to the chest, arm and wrist, and a hand module which patients can move around and grip. Highly-intensive, self-initiated and motivating, the ArmeoSenso enables patients to complete precise and repeatable assessments. The ArmeoSenso comes with a wide range of exercises and games, for patient interaction and performance feedback, either via the wrist sensor or the hand module. The ArmeoSpring allows simultaneous arm and hand training in an extensive 3D workspace with six degrees of freedom. Available in adult and paediatric models, the ArmeoSpring is the only upper limb rehabilitation device which offers selective joint control, which enables patients to practise precise upper limb movements that are key for their therapy progress and everyday life. It features an adjustable exoskeleton which supports the whole arm, from shoulder to hand, and counterbalances the weight of the patient’s arm. By providing this support, the ArmeoSpring, together with the Manovo hand module, enables patients to use any remaining motor function and achieve a higher number of reach and grasp movements. These therapy goals and activities can be based around the patient’s own movements. Built-in sensors record the active movements and joint angles for accurate reporting. Hocoma is the global market leader for the development, manufacturing and marketing of robotic and sensor-based devices for functional movement therapy. Summit Medical and Scientific were thrilled to partner with Hocoma in May 2018, and you can find out more about Hocoma and their products here. You can read more about our partnership with Hocoma here. Motek are the global leader in treadmill-based gait analysis and training, combining almost 20 years of experience in high-level technology and virtual reality. Motek excel in building the most versatile devices, integrating latest technologies and ensuring real-time data collection and feedback. Read more. Postal Address: See Contact Page. © 2019 Summit Medical and Scientific. All rights reserved. Registered in England No: 03927752. Registered Office: Unit 4, Bank Court, Weldon Rd, Loughborough, LE11 5RF.